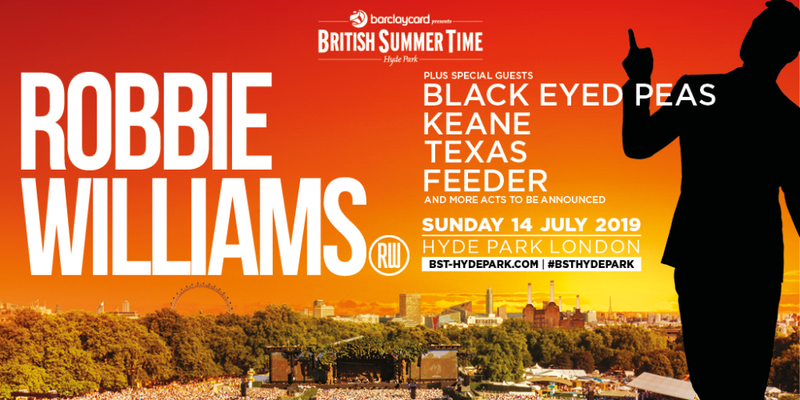 Robbie Williams will headline the Great Oak Stage for his only UK open-air show of 2019 with Special Guests to be announced - Barclaycard presents British Summer Time Hyde Park with huge headliner for 2019 – Britain’s greatest entertainer – Robbie Williams. Since bursting on to the stage as the youngest member of Take That in 1990 and then going solo in 1995, Robbie Williams has been at the top of his game for nearly 30 years and has become a national treasure. One of the most decorated artists around today, he has six of the top 100 best-selling albums in British history with 77 million albums worldwide, 14 Number 1 singles and won a record 18 BRIT Awards – more than any other artist in music history. This will be a "Let Me Entertain You " music experience at BST in Hyde Park in 2019! - Enjoy your day even more with a Ticket or VIP Ticket and Overnight Hotel Stay in the capital and all it has to offer! or chill out with the exclusive ** ULTIMATE BAR EXPERIENCE ** including Barclaycard VIP Summer Garden Tickets with access to GOLD CIRCLE STANDING or choice of DIAMOND VIEW Tickets, right in front of the Great Oak stage! - Arrive to a Welcome Glass of Fizz, Complimentary Bar, Comfortable occasional Seating, (The Ultimate Bar is an Exclusive Area restricted to The Ultimate Bar Pass Holders Only) The Ultimate Bar opens @ 1PM (TBC) - Public Doors 2PM - Whatever is right for you, British Summer Time will provide all the ingredients to enjoy your day in London's Hyde Park, with an incredible line-up of Artists and music! Robbie Williams BST Ticket and Hotel include a choice Primary Entry (early entry), Gold Circle, Barclaycard VIP Summer Garden, Diamond View and The Terrace tickets and a comfortable night in the UK's famous capital city - Extra night stays are also available. Provisional Times - Gates Open: 13:00H – please note the gates will be open approx. 60 minutes early for those customers who select Primary Entry, Gold Circle, Barclaycard VIP Summer Garden, Diamond View, The Terrace and *The Ultimate Bar * Opens @ 12:00H or arrive at your leisure - Age restrictions - Anyone under 16 must be accompanied by a parent or guardian (18 or over) - Disabled Access - All tickets are available via the festival website or AXS.com. There is a Wheelchair platform and an Ambulant area. All tickets come with 1 free personal assistant. We regret that special access tickets are only bookable via the BST website. exclusive DIAMOND VIEW (Premium Standing Area, directly in-front of the Great Oak Stage!) both sections allowing you to leave and return as you wish!